The Belgian former world champion wanted one final Classics campaign before bowing out on the Roubaix velodrome, where he won a record-equaling four editions of Paris-Roubaix. Add to that three victories at the Tour of Flanders, five wins at Grand Prix E3 Harelbeke, three each at Gent-Wevelgem and Kuurne-Brussels-Kuurne, a couple of editions of Scheldeprijs and one Dwars Door Vlaanderen and it's fair to say Boonen is one of the modern kings of spring. But what is it about him as a rider and a person that has ensured such levels of popularity in Belgium and abroad? 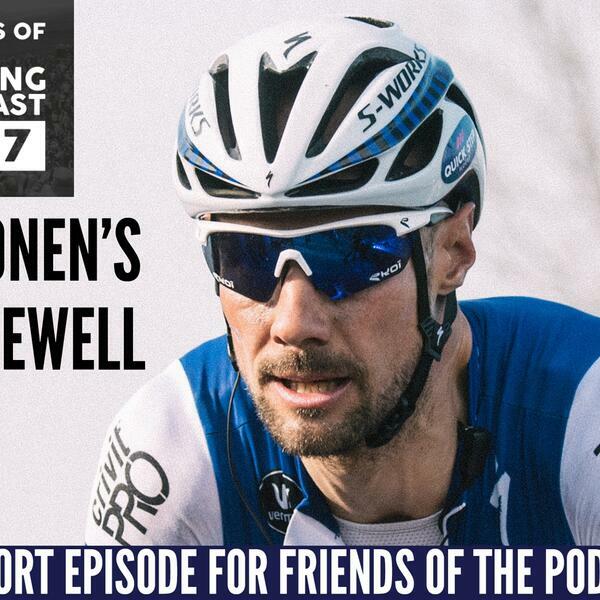 We hear from his long-time team manager Patrick Lefevere, sports director Brian Holm, rivals Andreas Klier, Sep Vanmarcke and Mat Hayman plus Belgian journalist Hugo Coorevits, who has followed every step of Boonen's career. Exclusive to Friends of the Podcast. Sign up on thecyclingpodcast.com to hear the full episode, along with 11 other in-depth specials.